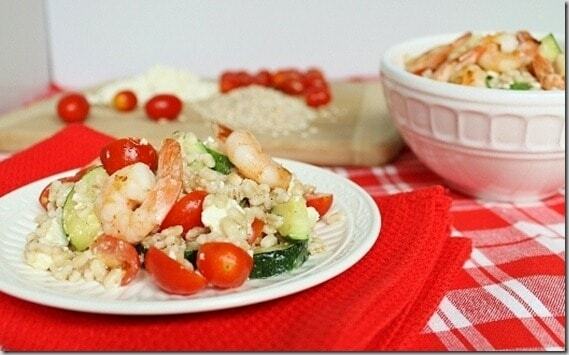 A quick and delicious summer barley salad recipe with zucchini, tomatoes and feta cheese to celebrate the end of summer. I made this summer barley salad about a week ago and figured I better post about it soon before the title becomes a little obsolete! If you’re anything like me, you still have a few zucchini on hand even though pumpkin and butternut squash are slowly taking over your thoughts day by day. Barley is one of my favorite “new” grains. I say “new” because prior to last year I had never cooked it myself. It seemed intimidating and something I’d only find in soups and dishes at a restaurant. That couldn’t be further from the truth though. You can cook barley the same way you do rice, 2:1 water to grain. Bring to a boil and then simmer until the liquid is absorbed. It has a fun chewy texture that beats out brown rice any day in my opinion. At first, I was going to make this as a side dish for dinner (I made it at lunch time) and then I tasted it once it was all combined and knew there was no way I was going to be able to hold out that long. So I said peace out to the boring hummus sandwich I had planned on and instead sautéed up some frozen shrimp for added protein and called it lunch. I seriously could not stop eating this barley salad. The lemony dressing gives it a tangy taste but the feta keeps it salty. Somehow, that combination works wonderfully. If you’re too impatient to let the barley completely cool before combining everything like me, the cheese will slightly melt making it even more delicious. Ulysses had the rest for dinner when he came home that night and it was gone in no more than 6 hours. I suggest at least doubling the recipe so the same tragedy doesn’t repeat itself. What’s your favorite and/or go-to grain? 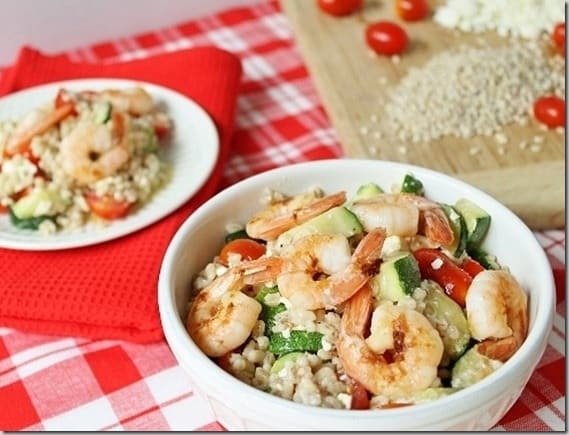 A quick and delicious barley salad recipe with zucchini, tomatoes and feta cheese to celebrate the end of summer. Cook barley on stove top. I cook it like rice with a 2:1 water to grain ratio. While barley is cooking, chop zucchini & saute in pan with olive oil for about 3-4 minutes just to take the "rawness" out. Prepare dressing in a small bowl by whisking together lemon juice, olive oil and salt & pepper. Combine zucchini, tomatoes and feta cheese in medium bowl. Once barley is fully cooked, drain and let cool for a few minutes. Once slightly cooled, add it to the bowl with the vegetables and feta. Love barley my favorite. How come I never made it? It’s still warming up to the eighties around here during the day– this looks perfect for lunch!! I think barley may be my favorite grain! I love the chewiness :) and this recipe looks fantastic- thanks for sharing! Favorite grain: oatmeal or brown rice — I love stir-fries and brown rice just seems to go so well with them. Great minds think alike. How many times have I said that in your comments??? 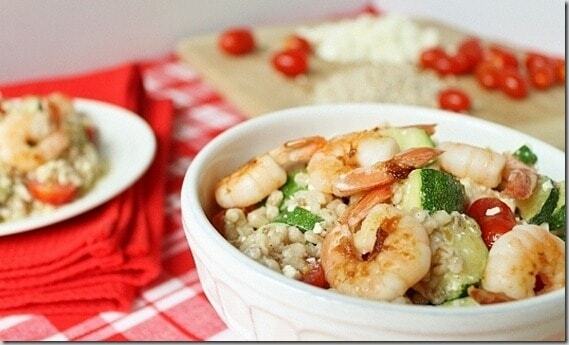 I just got some shrimp and barley, but I wasn’t sure yet what to do with them. Perhaps I’ll throw them together – thanks for the idea! This looks amazing!! Does Barley have a similar texture and chew to wheatberry?? I still can’t get my head around them but I really love the look of your salad! Funny you asked that b/c I almost described it as a “chew factor” in between rice and wheatberries. It’s a little less chewy than I find wheatberries to be. but that could be b/c I never have the patience to cook them as long as I should! YUM! This looks amazing. I think I have most of the ingredients at home too. Score! I’m usually a brown rice girl through and through – I definitely don’t give barely/quinoa and others enough love. I gotta change that. I’ve never made barley before, but apparently it is super easy. This salad also looks super easy, but so delicious! Oatmeal is my favorite…but I should branch out and try other grains! This looks wonderful as usual Gina, thank you! There are so many fabulous grains out there, its hard to choose just one! Barley is really a great one and I love that you incorporated it into salads – I’ve always used it in soups, but it seems there are so many other great uses for this fiber-licious grain. I tried barley for the first time earlier in the summer and love it. It’s so hearty! My go-to grains are oatmeal (breakfast, baking) and quinoa (entrees). I haven’t met a grain I haven’t liked. I definitely have zucchini in my fridge still…and this looks like such an awesome use for it! I love the simplicity in these flavors, Gina!! This looks so good. So good in fact that I shopped for the ingredients yesterday, just made it despite Mike being in class late tonight and me not feeling well, and am devouring it as I type! Thanks so much for the recipe. I am going to blog about it later this week and link back to you and the recipe! Does Barley have a similar texture and chew to wheatberry?? Can’t wait to do a grocery shop! This looks wonderful as usual Gina, thank you! I’m usually a brown rice girl through and through – I definitely don’t give barely/quinoa and others enough love. It’s similar. I think wheatberry has the most chew, then barley then brown rice. I love them all though and any would work in this! I never know what to do with barley. This looks amazing and I have everything I need to put it on the table tonight. I love it when that happens!